Why are they protesting? Why are they so upset? Why should we care? Department of Social Sciences, MEChA, and the Democratic Party of Grant County. Dr. Mary Hotvedt, Chair of Grant Co. Democratic Party was pushing the agenda of Occupy and educating people about it how it works. I have never interviewed Dr. Hotvedt, but I would assume she knows something about Occupy if she is going to be teaching about it. 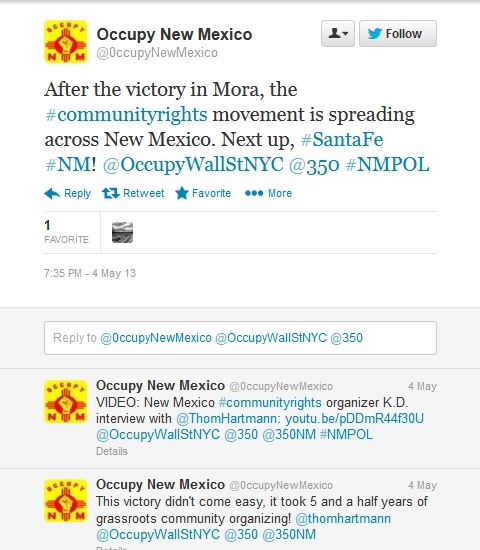 With obvious support coming from the Democrat Party, we turn to WHO keeps the Occupy movement working in New Mexico. 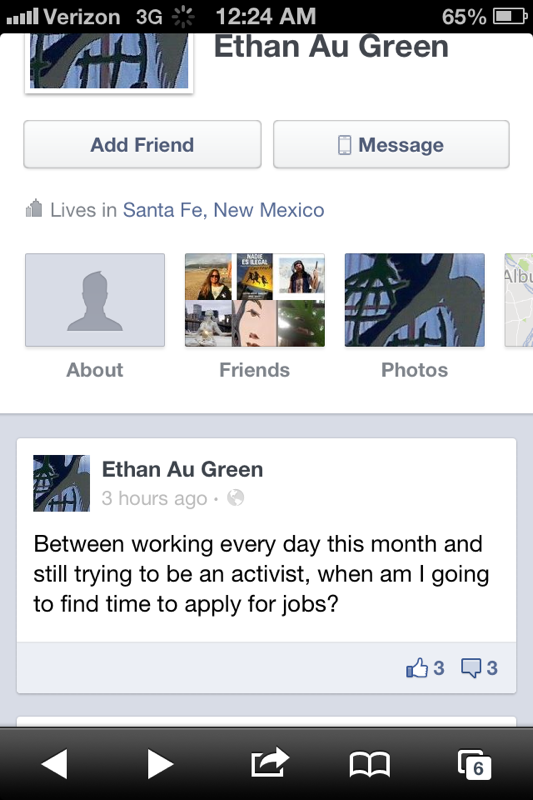 Jeff Ethan Genauer, a man with a handful of aliases, is a thirty-three year old political activist living in northern New Mexico. Mr. Genauer has worked for various radical political groups for years as he pushes environmentalist issues. He goes where he is told to go working for various environmentalist groups. This man is a community organizer by definition but also a self-proclaimed ‘anti-Zionist’ and ‘eco-anarchist’ Jew. “Poor, indigenous and environmentally vulnerable communities should not bear the brunt of disease epidemics, droughts, floods, melting ice, rising oceans, hurricanes and other catastrophes caused by the global climate change at rich countries are responsible for due to our prodigious burning of coal, oil and gas for energy,” said Ethan Green of Rising Tide North America. The Camp for Climate Action hopes to attract thousands to England’s Megawatt Valley on Aug. 26-Sept. 4 to learn about global warming and techniques for direct action against “climate criminals.” Participants plan to converge on the Drax power station Aug. 31 for a creative mass action to shut down the United Kingdom’s largest emitter of carbon monoxide. Rising Tide has joined forces with environmental justice groups combating pollution from refineries, power plants and coal-processing facilities. “Unlike Rising Tide, most other organizations who say they work for climate protection merely promote technological reforms to the capitalist economy, and shy away from demanding deep changes that address the common causes of war, social and economic injustice and ecological destruction,” said Philadelphia-based activist Ethan Genauer. Other groups Genauer has been active as a writer at resilience.org, jews4foodjustice.blogspot.com, earthfirstjournal.org. 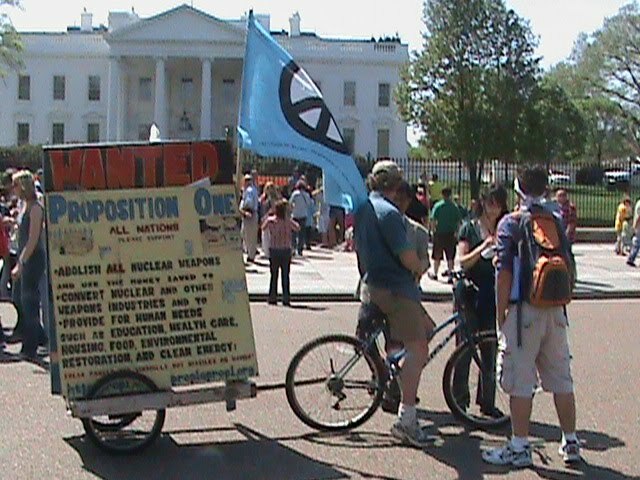 In 2010 Genauer supported the Code Pink movement as it marched on Washington on Mothers Day. He also shared pictures of himself protesting the use of nuclear weapons the same month. Genauer currently works at School Gardens Across America, was educated at Rutgers University and Northern New Mexico College according to LinkedIn. Seeking to further the environmentalist agenda Genauer was a candidate for Environmental Education Association of New Mexico’s board of directors in 2011, an organization furthering ‘the cause’ Genauer pushes. He spends a lot of time in Santa Fe where he has worked as a tutor for NNMC, but also frequents Albuquerque for political events. 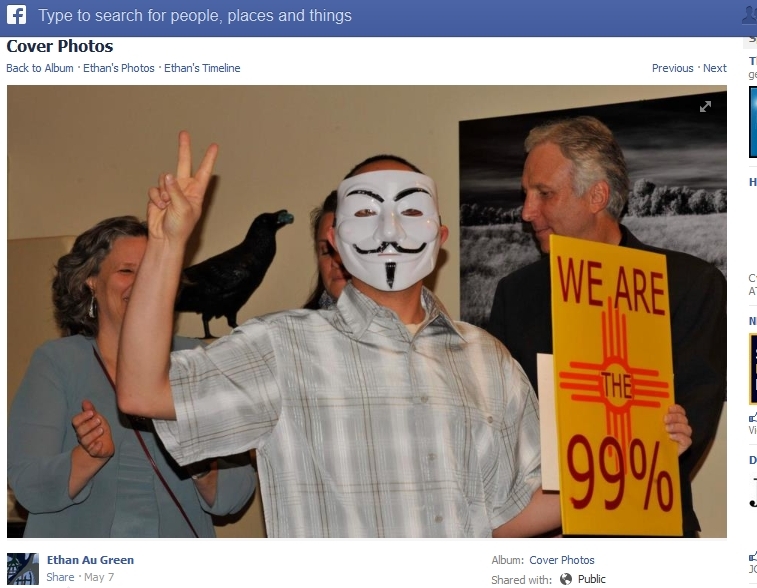 As to Occupy connections go, Genauer has been recognized by La Jicarita‘s New Mexico’s online environmental political blog as the man behind Occupy New Mexico’s internet activism. Genauer also received a mention as the webmaster for OccupyNewMexico.Org by journeysantafe.com. As Genauer wrote in the tweets above and elaborated below, not only has the Mora agenda been something the left has been working on for a long time, but it is something that Occupy and the left will be pushing for in Santa Fe and other places. We need to oppose these people and protect freedom! Here in New Mexico, community rights organizing is going strong in the town of Las Vegas and in neighboring Mora County, and it is also taking root in Santa Fe, Taos and other communities. In Las Vegas, the city council has passed a “Community Bill of Rights” which bans bans natural gas fracking within the municipality, although the mayor has refused to sign the bill and he is now facing a recall campaign from grassroots activists. In Mora County, advocates for community rights won the 2012 election and now hold the majority of seats on the county commission, which they are using to craft an ordinance to ban fracking and protect local water rights. E&E reports the community rights movement is continuing to grow in New Mexico. The evidence for this growing movement is beginning to appear in Santa Fe. On Tuesday, April 16, 5 to 6 pm, tune in and listen to KSFR 101.1 FM Santa Fe Public Radio host Diego Mulligan interviewing Thomas Linzey, the senior legal counsel for the Community Environmental Legal Defense Fund (CELDF) during his radio show from 5 to 6 pm. Then on April 19 and 20, CELDF will present a Democracy School in Santa Fe, NM for about 25 participants, followed by a strategy session on building the community rights movement in New Mexico and throughout the Southwest. These people have all the time in the world because they are paid by the left to do this work…most of us on the right are unpaid and are simply volunteers such as myself with a passionate love for our country. We work when we have time to further our cause, but do not have an expense account and pay for nearly everything out of our own pockets. Because of this we need to be extra watchful and band together to win! Keep up the good fight, fellow Americans, and do not give in!! The Mora agenda’s of the left must be stopped as we defend the pillars which are nation was founded on! Have a tip regarding this story or another pieces of interesting information to share? Email me here! Another thing you can do is contact the New Mexico Democrat Party here and ask why they appear to support the Occupy New Mexico movement on their website. 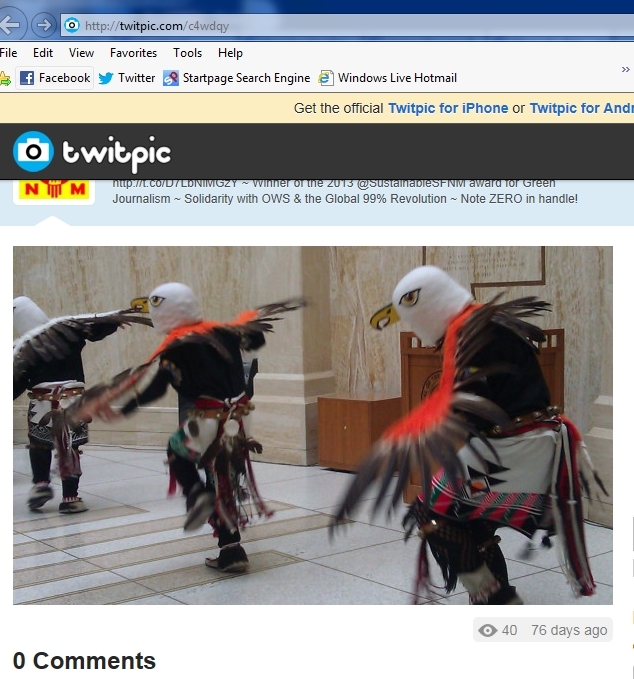 Previous Post: Why is Liz Harrison’s Twitter Account in Gulag? Looks like the terrorist he is. If he’s so proud of himself, why doesn’t he show his face? I know what his face looks like, but just as you brought up, it is interesting that he is not too proud to be in the open…he prefers doing his work of tearing down freedom quietly. 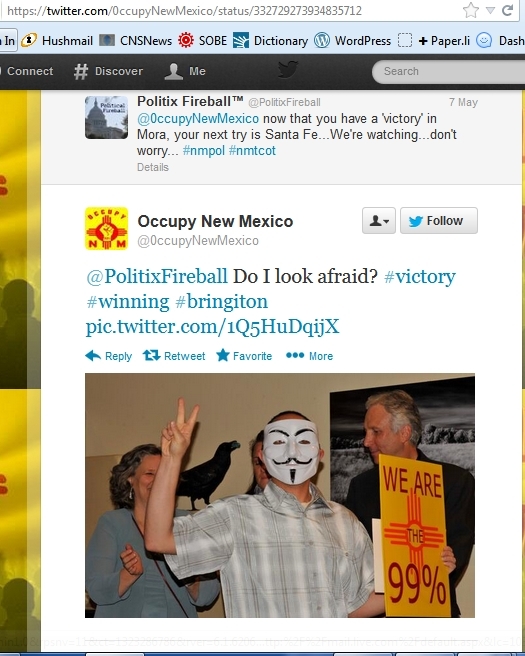 Occupy and Anonymous are famous for their exposes and attacks on innocent people. This time one member, Genauer, has been caught. Occupy is not political. There are people who align themselves with Occupy that have voted Democrat, Republican, Green, Libertarian, Independent, and many who refuse to vote at all. Occupy does not push a Democratic agenda, or ANY political agenda, but rather see Democrat and Republican elected officials as shills who have been bought out by their corporate overlords. People who work with Occupy are not paid. 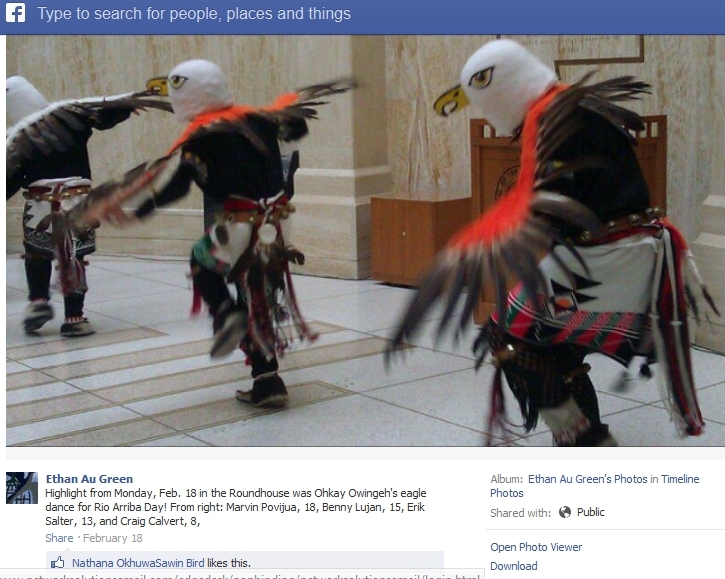 They do the work of researching issues, disseminating information, educating, and creating positive action. They do this work as volunteers, for the love of their fellow humans. They do not have an expense account and pay for everything out of their own pockets or through the generosity of their peers. You got one thing correct….Occupy will continue to fight against the corporate greed that has caused the oil and gas industry to run amok, and work to prevent it from destroying the amazing land and water of New Mexico. Thank you for commenting, Alex. While much of what you stated is incorrect your taking time to share your views is appreciated. The occupy movement has many factions most of which include some kind of either Communist or Anarchist background. The Occupy movement was started by relatively young activists such as Mr. Genauer who received free college due to the generosity of their parents or others and found while in college turned toward the liberal viewpoint– they see that there is much suffering in the world and want something done about it. They see the government as an effective way to further their goals. Behind the scenes we have hard-left activists who support the group and fund it’s workers, community organizers such as Genauer. If the 99% agrees is about all of us, why doesn’t an average person like me agree with it? I know of nobody who identifies with this movement, yet Occupy is the ‘99%’? Another point of interest Mr. Genauer attended an Ivy League University, yet he is average? How is that justice? As to corporate greed, you are decrying capitalism and freedom of our people to work in a system of free enterprise. It is Socialism and Communism to force the government to regulate our freedoms. On top of that I would like to remind you of the Mora agenda which is a predecessor to Agenda 21 and the ‘sustainable environment’ your occupy group is furthering. This will not work for our society. Occupy does NOT support Agenda 21. Occupy does NOT see the government as a means to reaching their goals, but rather community organizing. I think the people need to find a way to work together, to find common ground. Only then will we progress as a society. We must move past divisiveness. Furthering ‘sustainability’ is most certainly exactly what Agenda 21 is about. If you do not understand this, I would recommend you research Agenda 21 better. Community organizing is a term which has a progressive, leftist history by definition. Although there are varying definitions, it is certainly a leftist, progressive method for getting work done. Community organizers get people into a frenzy, which will in turn force government to see things their way through protests and often violent behavior (which is characteristic of the occupy movement. Genauer is his own person and not a minor. I’m not ‘stalking’ a young activist, I am exposing a grown man for what he is, a progressive environmentalist leftist pushing the agenda of the New Mexico Democrat party on the grassroots level. 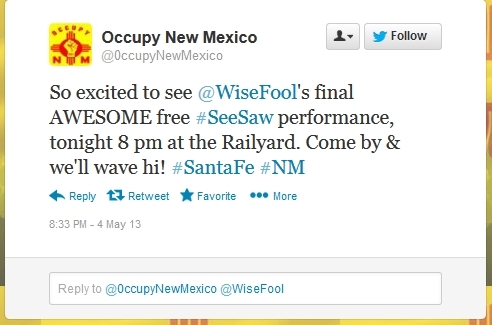 Is there any way for you to prove that Occupy New Mexico is not supported by the Democrat Party? Please enlighten me. Yes, we need to keep American strong! And #1. Our major source of income is weapons! We are now killing people, I mean liberating them, in 7 or 12 countries! Our child mortality rate is climbing, but it isn’t yet #1. Okay you guys…what are you hanging onto…freedom to do what? We do NOT have a healthy government, and it is proto fascist as it stands. Do you want your freedoms? Then hearken to the Founding Fathers who said that every generation needed a revolution. Don’t you think we are past time? If you don’t have the spirit of ’76 in you, please don’t call yourself a patriotic American. These folks are fighting for th Bill of Rights, and for human rights. Your generation allowed the Military Industrial Complex of which Eisenhower warned of to privatize multiple times, bleeding our nation of young men and women, our morality, and money. And for what? The “war on terror” is a hoax to continue the exploitation of oil rich countries. Instead of selling out the soul of American, why don’t you stand with the great Americans who believed in a living democracy. If you don’t like this person, why don’t you meet up w/ him and find out what you DO agree on and see if you can’t work toward a more perfect union. Perhaps you should read more history and try to understand what our founders meant when they said we should value freedom? The ‘sustainability’ garbage pushed by your Occupy ally is not something we need. Our founders also made the ‘war’ statement to encourage us to understand that they fought hard for this nation and it may take more fights to keep that freedom secure. They were not anarchists like your Occupy pal. ‘My generation’ is the problem? You would do well to not assume anything about me. It is a very poor argument to claim you understand me when you do not. Be a tolerant member of the left and please do not assume. Mr. Genauer is here to destroy the greatness of our nation by fundamentally changing it. This is his job. He might be a nice person, but his agenda is to tear down, while mine is to build up and protect. Our nation’s Constitution is not a changing document. It is just as valid today in it’s original interpretation as it was over two hundred years ago when it was drafted. I can understand that Genauer and I may agree on a few issues– we both are passionate about our beliefs, but you seem to fail to understand that he is seeking to destroy, while I am seeking to build and maintain. Maybe we all dig freedom of speech for instance, or splendid and wonderful country. And perhaps that’s a starting point, eh? This is not what society needs. And it certainly is not something a peace-advocate should support. As to common ground, we are Americans, but our viewpoints are extremely different. I am willing to work together, but those who are seeking to destroy our society must be called out.